Sometimes the end of the garden is better than the whole summer season! 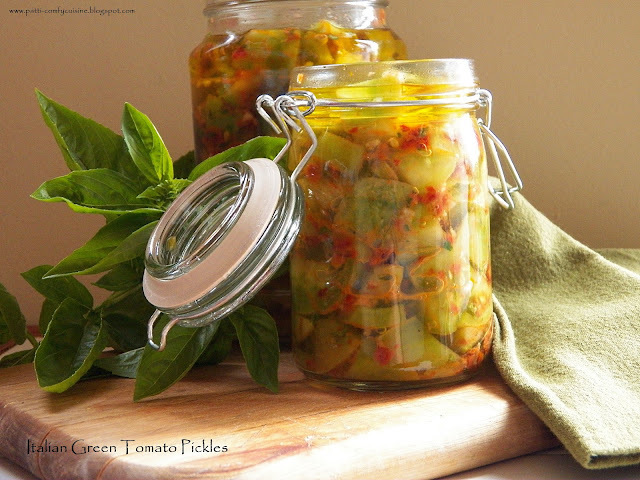 This recipe for Italian Green Tomato Pickles would be perfect for an antipasti platter. Chop the tomatoes into about 1-inch pieces and place in a medium bowl. Sprinkle with salt and mix in thoroughly. The next day, place tomatoes in a strainer and rinse thoroughly. Leave a few minutes to drain. Place the sun-dried tomatoes, garlic, chili flakes and basil in a blender or food processor and pulse into a coarse paste. Return tomatoes to mixing bowl; add paste mixture and toss together to coat tomatoes. Pack into sterilized jars. Fill jars to within 1/2" of the top. Carefully pour in the white wine vinegar until it just covers the top of the tomatoes. Gently pour a thin layer of the olive oil so it just covers the surface. Seal the jars tight and store in a cool, dark place for one month. you'll be under the tuscan sun. Just to clarify...these are not processed in a hot water bath, correct? just put the lids on and store? The recipe Coby was to sterilize jars and lids and store. I would refrigerate after opening! This looks delicious!! Thanks! How long do you suppose these will last unopened and then once opened?